It may be about the journey, not the destination—but who’s going to complain about ending at a glowing rock amphitheater? The West is known for big landscapes, broad horizons, and wide-open skies. And the Grand Staircase-Escalante National Monument, where Golden Cathedral is located, may be the biggest, broadest, and widest of them all. The trail begins on the edge of Egypt Bench, a plateau that overlooks a vast panorama of slickrock domes, sand dunes, and canyons. The Escalante River flows a few miles to the east, and the Henry Mountains poke above the slickrock horizon in the distance. From the register box at the trailhead, you immediately start a steep descent of the bench. Be skeptical of cairns—they’re all over the slope and don’t mark a single route down. Instead, play connect-the-dots or find your own path that generally descends northeast (a topo map or GPS is helpful here). 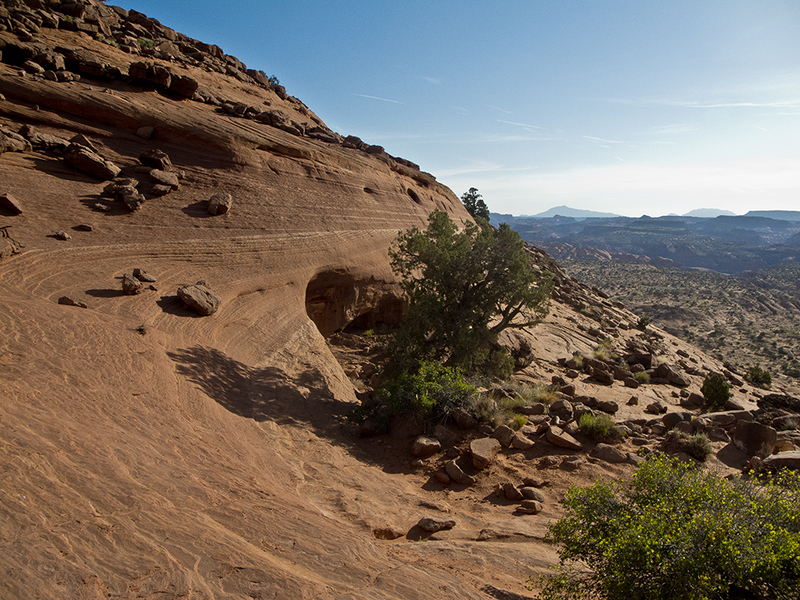 As you switchback down the slickrock bowl, look behind for a visual marker of your entry point. Look for the black rocks near the top of Egypt Bench; the trailhead is to the right of those scattered rocks. After a half mile, the grade flattens and you start a leisurely walk to Fence Canyon. The trail undulates across smooth rock domes and sand dunes for the next 1.5 miles. Regardless of the route you take down, you will likely be able to follow boot prints on a sandy path. 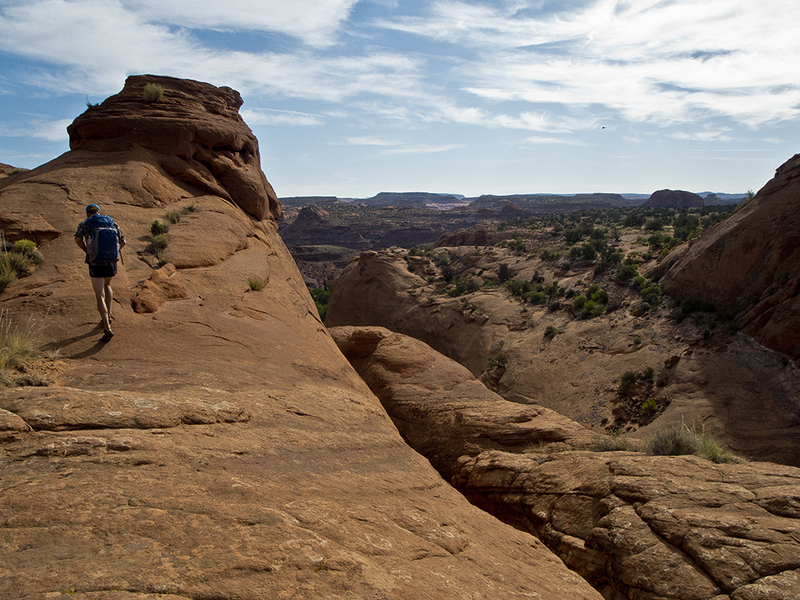 Cross the boundary into Glen Canyon National Recreation Area, and continue walking northeast towards the Escalante River. Fence Canyon begins deepening shortly after. The route parallels the south fork of the canyon. Stay on the left rim, and avoid cairns that lead you down to the bottom, because the canyon cliffs out in a series of huge drops and pools—an interesting side trip but one that requires you to backtrack up to the rim. Glance at a topo map and then look at the landscape ahead of you. The south fork and north fork of Fence Canyon feed into one another just ahead. Follow cairns along the juniper-studded expanse of slickrock between the forks; a narrow finger of land separates the two, and the trail steeply descends into the main canyon along this feature around 2.5 miles. Steep switchbacks take you quickly down to the canyon bottom, which is lush with cottonwood trees and horsetails; but beware of biting deer flies! 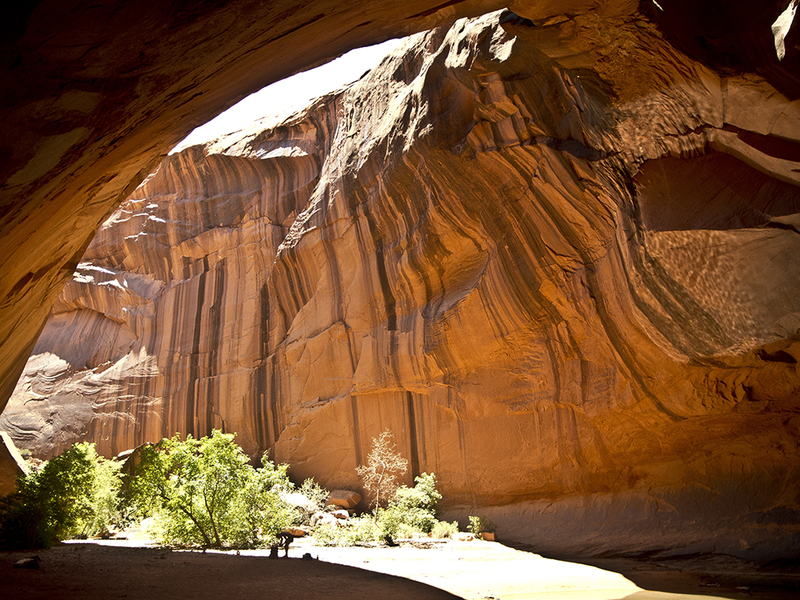 At 3 miles, you reach the Escalante River. Turn right and head downstream for the next 1.25 miles. You can hike in the river or on the banks, but it’s a choice between a slog through water or a bushwack through tamarisk and Russian olive trees. 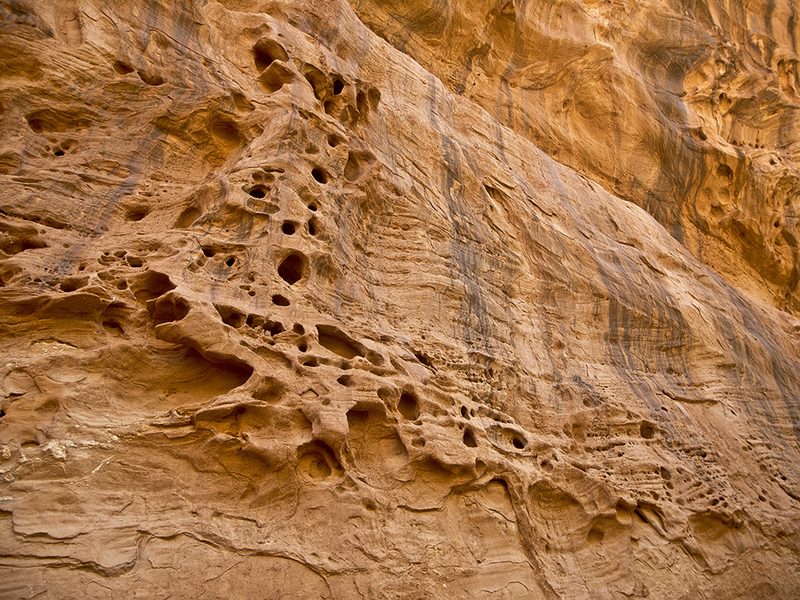 After a few river meanders, keep your eyes on the left canyon wall for Neon Canyon. It’s unnamed on topo maps, but it’s the first tributary you encounter on the east side of the river. Neon Canyon is a beautiful slot canyon, but without technical gear you can only explore its lower reaches. Desert varnish paints zebra stripes on the sheer walls, and cottonwoods provide pockets of shade. Continue upcanyon for about a mile, where you dead-end at Golden Cathedral. 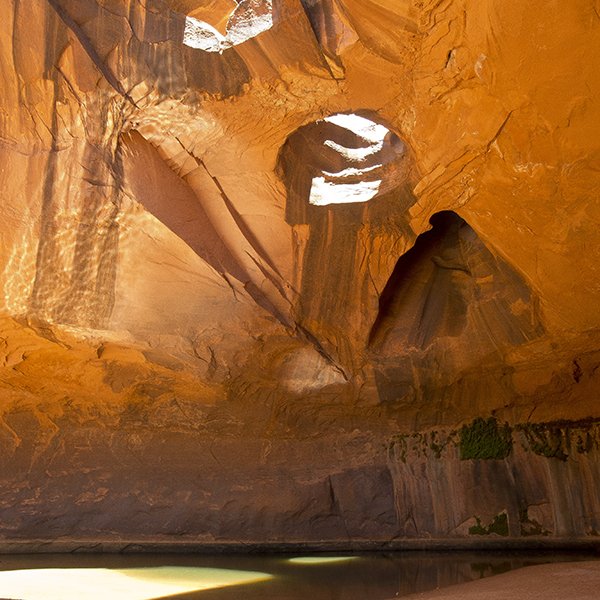 Light pours through three holes formed by natural bridges and casts an orange glow on the rock amphitheater. Relax near the pool of water and enjoy the cool alcove before the long trip back to the trailhead. Continue heading southeast on this road for 16 miles, and turn left onto the spur road marked “Egypt.” From here, the trailhead is 10 miles ahead--you must cross several washes (some may have water), and drive up a few steep, rocky slopes. Near 25.5 miles, the road forks. Veer to the right towards the Egypt trailhead, which is a half mile down the road, deadending in a looped parking area. Note: In dry conditions, Hole-in-the-Rock Road is usually passable for low clearance passenger cars. The dirt road leading out to the Egypt trailhead, however, requires high clearance and possibly 4WD. Call or visit the Escalante Interagency Visitor Center before you leave to get the latest road conditions report and plan your trip accordingly.